The the pipes next to the control room at ECVB abandoned powerstation. Not much to say about this one, except that I wanted to make the image my own in terms of style, and for it to be a bit different from the others out there. Large scale is not really my ‘thing’, I always prefer the smaller details, so as I mentioned in my previous post it was quite a challenge for me to photograph this vast place and to do it justice. Was quite happy with the way this one turned out in the end though. This entry was posted on Monday, October 17th, 2011 at 17:48. 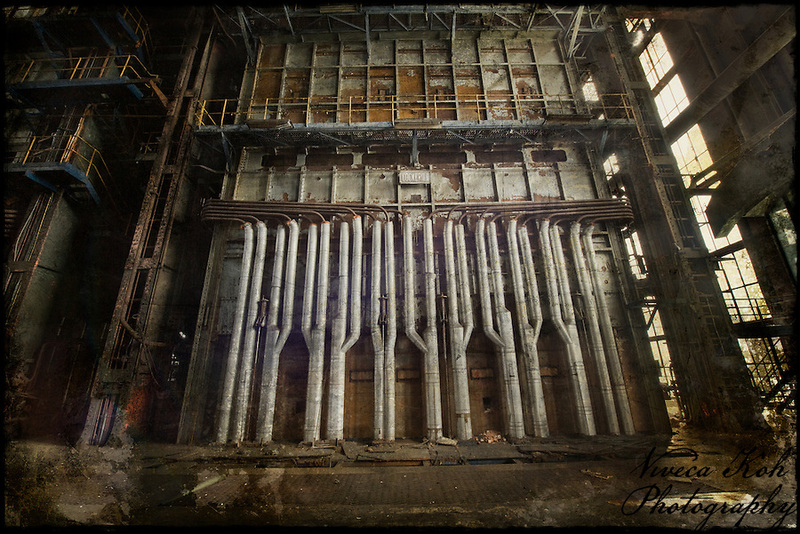 It is filed under Industrial, Urban Exploration and tagged with abandoned, Belgium, Digital Image Manipulation, ECVB, powerstation, texture, Textures, UE, Urban Exploration, UrbEx. You can follow any responses to this entry through the RSS 2.0 feed. you did a great job showing us the dimension of this place. it must have been majestic during its glory days. Sad that it is gone now. I like how it turned out V. Very nicely processed and it does have a cathedral look. Well done! Love the composition, mood, perspective and processing. What a wonderful photograph, Viveca! I love your composition and framing here, you’ve produced a really unique piece!! Awesome, gritty shot you got here. I absolutely love it. Your title couldn’t fit more perfectly as well! Well done Viveca. Sweet shot. I see where you were going with the title of this image. it fits perfectly!